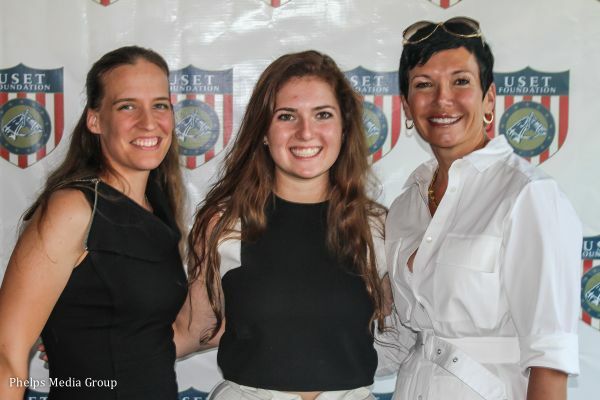 Wellington, FL - The international arena at the Global Dressage Festival facility in Wellington, Florida, usually host to top-class dressage horses and riders, showcased a different kind of talent on Sunday night. A spectacular stage replaced judges' boxes and dressage letters, and 13 finalists selected through a series of auditions showed off their diverse talents at the American Equestrians Got Talent (AEGT) Finale. After two very competitive rounds, singer Brian Lookabill came away with the AEGT victory. The finalists, all of whom are part of the equestrian community, put on acts ranging from dancing and singing to fire baton twirling and stand-up comedy for an appreciative audience watching from the VIP tent and bleachers as well as from all over the country via the Chronicle of the Horse live stream. Taylor Hughes, Ki-Juan Minors and Teaghan James. Photos by Mary Adelaide Brakenridge. Both attendees of the event and those watching on the live stream could make an impact on the outcome by voting on their smartphones, making donations to the United States Equestrian Team (USET) Foundation for each vote. 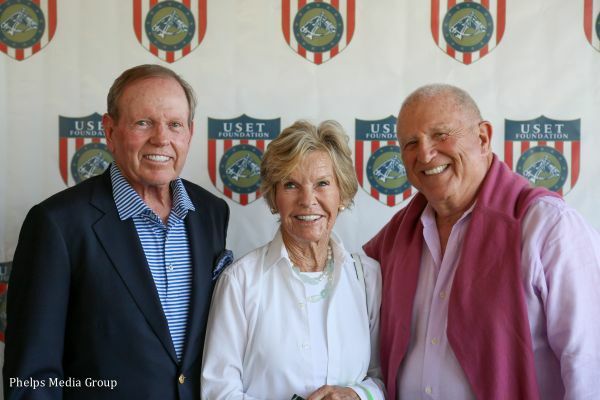 Funds raised at the event, along with the $35,000 raised by The Grille Fashion Cuisine at the nine auditions leading up to the Finale, support USEF High Performance Programs through the USET Foundation. The event is dedicated to supporting dressage but has a wider influence as well: 10 percent of funds is split between all of the other FEI disciplines, and 10 percent goes to show jumping since the winner, Lookabill, was competing on behalf of that sport. After the first round, featuring performances from all of the contestants, the top four returned for a final round to determine the winner. Six judges - Mark Bellissimo, Carmine Gialanella, Tami Hoag, P.J. Rizvi, Leslie Streeter and Chrystine Tauber - were on hand to critique the performances, and their selections counted for 50 percent of the result in both rounds. The other 50 percent was determined by audience voting. Lookabill, Taylor Hughes, Teaghan James and Ki-Juan Minors were the front-runners after the first round and squared off against each other in the second round. All four qualified for the Finale as solo singers, and while they made various use of back-up singers, dancers or instrumentalists, the focus was on their vocal skill and power. Several of them opted to show off their range by choosing two very different songs as their first and second numbers. Lookabill started things off with an upbeat rendition of Mark Ronson and Bruno Mars' "Uptown Funk" and then brought guitarist Josh Young into the mix for a stripped-down performance of Whitney Houston's "I Will Always Love You." "I thought that it would be smart to show some different facets of my ability," Lookabill said. "The first song was to get the audience up and into it and have fun, and then I wanted to do a song that is timeless yet still very popular. I could put a twist on it as a man doing it because it's a women's song with a lot of range. "I'd like to salute Robert Dover, Sara Ike of the USET Foundation, and Annie Cizadlo, who did a fantastic job of getting everything organized," he added. "Thank you to everyone for their support, including my son Cole, who called to cheer me on several times during the night. And a special thanks to Rock Star Dry Cleaners in Wellington for going out of their way to help me on the day of the show." Lookabill took home the $5,000 top prize sponsored by Robert Ross, P.A., Luxury Equestrian Realtor for Keller Williams, clinching the win over Minors in a tight race. Minors earned the $2,500 second prize courtesy of Visse Wedell, and On Course Consignment sponsored the $1,000 third prize, which James won. The fourth place prize of $500, sponsored by Oded Shimoni Dressage, went to Hughes. A live auction was held between the performances and featured several incredible items: luxury trips offering up-close experiences at the 2015 Central Park Horse Show in New York City, Pan American Games in Toronto and FEI World Breeding Dressage Championships for Young Horses in Verden, Germany; a four-day cruise to the Bahamas on a 115' yacht; a head-to-toe outfit for horse and rider including an exclusive Hèrmes coat and Custom Saddlery saddle; and a day with each of the Team USA dressage coaches. "I am completely thrilled with the event last night," said Robert Dover, Chef d'Equipe of the U.S. dressage team and organizer of AEGT. "I am so appreciative to everyone: all of the sponsors, the volunteers, the people who came out to support the event and those who watched it live at Chronicle of the Horse online. 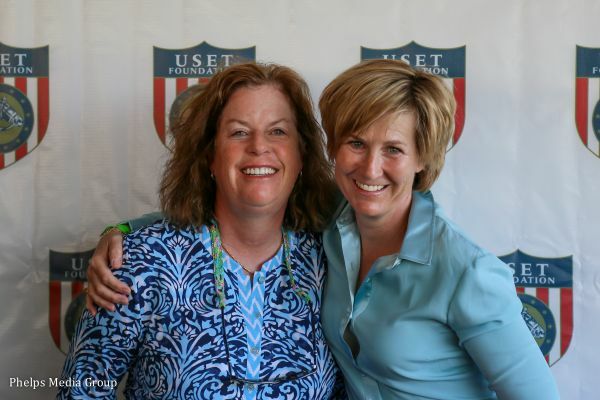 I'm really excited about the large amount of money raised for the USET Foundation and our athletes and programs." For more information on the USET Foundation, please call (908) 234-1251, or visit USET ONLINE at www.uset.org. The USET Foundation has been awarded Charity Navigator's highest honor, a Four Star rating for good governance, sound fiscal management and commitment to accountability and transparency.